Create unique decorative and functional designs with Koffler''s Decorative Metal Sheets. Two unique options available. Reflective 22 gauge Stainless Steel Sheets create a mirror like appearance, delivering the polished look of chrome with the strength of stainless steel. 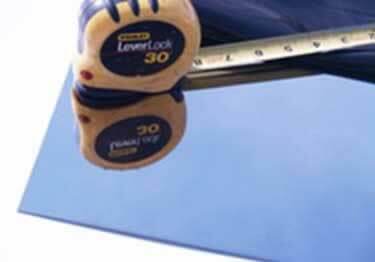 Great for many applications, from trim on trailers to mirrored wall accents. The cosmetic Stucco Embossed Aluminum Sheet option comes with a white primer finish on one side and a silver (mill) finish on the other side; either side is usable and looks great! These easy to clean, embossed 0.024" aluminum metal sheets can be used in functional applications like as refrigerators and solar heat reflectors, or in decorative applications to create a rugged, industrial look. Great for use in trailers, RVs, locker rooms, restrooms, airports, hospitals and commercial kitchens. The stucco embossed aluminum sheet also creates a great low-maintenance wainscoting. Reflective Stainless Steel Sheet Sizes: 24"x24", 24"x48"
Cosmetic Stucco Embossed Aluminum Sheet Sizes: 24"x24", 24"x48", 48"x48", 48"x96", 48"x120"
Stucco embossed 0.024" aluminum sheets are white on one side and silver/mill on the other side. Either side can be used. Create unique decorative and functional designs with Koffler''s Decorative Metal Sheets. Two unique options available. Reflective 22 gauge Stainless Steel Sheets create a mirror like appearance, delivering the polished look of chrome with the strength of stainless steel.